Reader's of THT should know that Michael Teacher maintained a positive and even casual relationship with his Namseon Middle School students. Often, the Harrington couple would meet Namseon students at the OEC Cafe to enjoy green tea lattes, hot choco's and rounds of Uno (which Michael Teacher had a knack for winning). Not only did Michael Teacher offer his students the opportunity to meet up during his off hours, but multiple mornings, Michael Teacher walked a few blocks to watch his students compete in basketball tournaments. Therefore, it comes as no surprise the Michael Teacher had a good handful of students whom he knew well and were generous in their actions toward him. 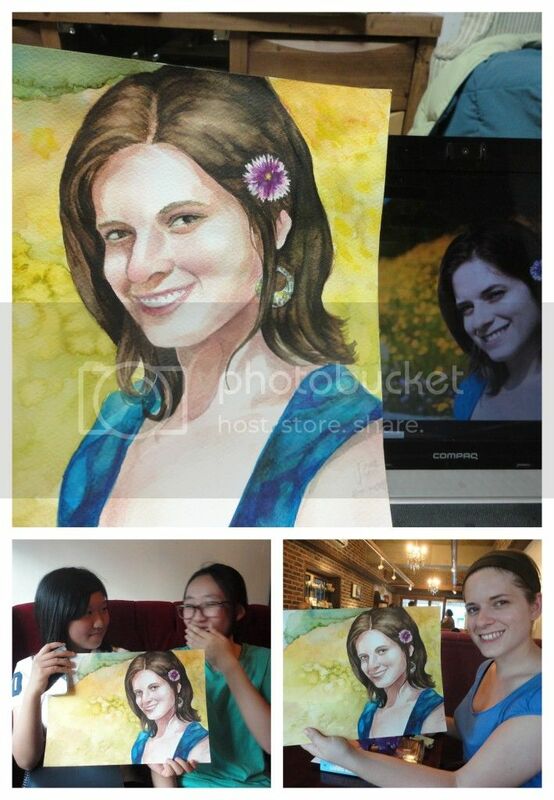 As the end of their two years in Korea came to a close, the Harringtons made their way to the OEC where Melissa would be surprised to receive original watercolor artwork from one of Michael Teacher's students. Readers may not be aware of the man's knack for romantic gestures, yet truth be told the man Harrington comes up with some all out wins in the romance department. Having one of his artistic students re-create a beautiful photo (the work of the beautiful and talented Alla Ponomareva) is just one small example. Having received a precious gift at OEC, a few days later it came time for the Harringtons to give away a precious gift. Many reader's may not know that the Harrington duo housed more than one pet in their Korean home. Before Lady Annyeong entered the life and times of the Harringtons there existed a series of fish who were held accountable for fertilizing the man's experiments in aquaponics. Unfortunately, as is common with goldfish, many quickly made their way to fishy heaven. However a few strong fishy souls survived and were eventually named Mr. Mu, Jeju and Kimchi. Jeju disappeared mysteriously in the spring of 2011 and Mr. Mu eventually went belly-up. Kimchi, however, continued to fight the good fight and continued running strong for over a year. Knowing that sweet gold fishies were not allowed overseas passage, the couple started asking around attempting to see who might be interested in a strong and happy little goldfish. After many interviews and inquiries the couple finally hit the jackpot with one of Michael Teacher's most responsible and trustworthy students who had already expressed her success at caring for a tank of fishies. So it was, at the OEC that the Harringtons said good-bye to their first pet who survived long enough to be named and given away. 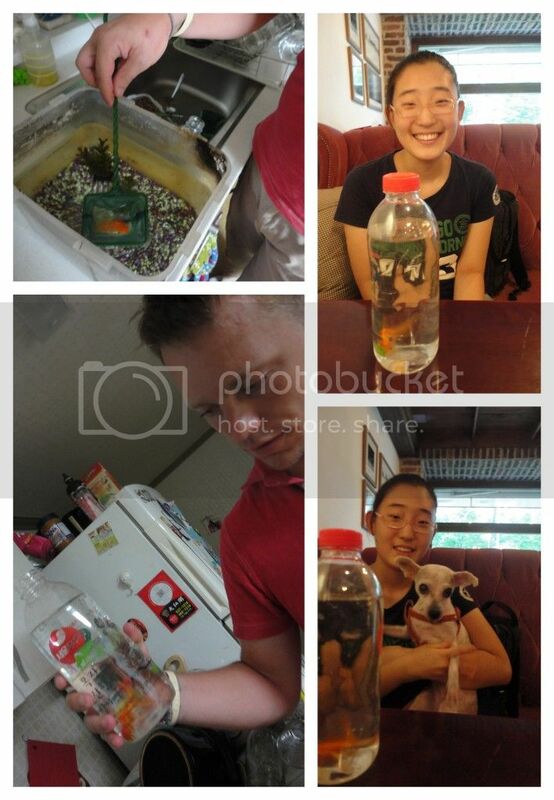 Since returning to the states the couple has received a picture of Kimchi with his new goldfish family and feel great joy at knowing he is being loved and integrated with others of his kind.